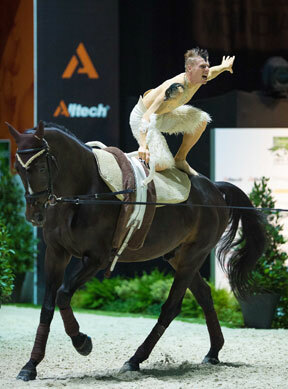 Vaulters from France, Great Britain, Austria and Germany all climbed onto the top step of the podium today as the 2014 Alltech FEI World Equestrian Games™ Vaulting championship came to a thrilling conclusion at the Zenith Arena in Caen, France. The bling and glitter, razzmatazz and showmanship that accompanies this equestrian discipline were all very much in evidence as vaulters battled for medals in Pas de Deux, Male and Female Individual and Squad events. But so too was the pure skill of the world’s best vaulting athletes, and the packed stadium of spectators loved every moment of it. Pumped up with excitement, and applauding each nation’s vaulters in turn, the crowd became so loud that they had to be asked to restrain themselves. But they didn’t hold back when it came to the medal ceremonies, especially when Jacques Ferrari registered the first gold medal of these Games for France when taking the Male Individual title. Coming into today’s final competitions, scores in all categories were carried from the previous three days, and in the Pas de Deux there never seemed the slightest doubt who would take the shiniest medals of all. Austria’s Jasmin Lindner and Lukas Wacher posted a massive score of 9.035 to leave the result beyond doubt, and their final tally of 9.039 left them 0.454 ahead of the silver-medal-winning German duo of Pia Engelberty and Torben Jacobs while British sisters, Joanne and Hannah Eccles, claimed the bronze. Lindner described the atmosphere of the arena as being “like a circus”. The crowd’s excitement and engagement with the sport throughout the entire day, which began at 10.00 and finished a full 12 hours later, never wavered. “You’re in the middle of the arena and the people all around you clap their hands and shout because they are enjoying your freestyle, and that’s an amazing feeling!” Lindner added. Talking about the work that herself and Wacher have put in on the road to success, Linder continued, “we are really proud of this because we’ve trained towards this goal for many years and now we have reached the gold medal. We really trained hard and concentrated on each step” she explained. Her partnership with Wacha is a very solid one. Together they won Austria’s very first world title in Vaulting when Pas de Deux made its debut at the world championships in 2012. The pair, their horse Bram, and their lunger and trainer Klaus Haidacher have proved untouchable ever since and, favourites to clinch gold again this week they didn’t disappoint, impressing the judges to achieve one maximum score of 10. “A score of 10 is very rare, and it’s a new freestyle for us. In the background we said that to get one 10 was our goal and we reached that in our first freestyle, so that is another success for us!” said the delighted 18-year-old student. Eccles was in a league of her own when climbing two steps further up the podiuml later in the day to clinch the Female Individual title for the second time. From the moment she began her programme the smoothness, fluidity, lightness and athleticism that has earned her near-legendary status, along with a huge following of fans, started racking up big marks. Her signature one-handed cartwheel and handstand once again demonstrated the physical strength that lies beneath a picture of pure elegance. And when judges Veronique Gerard (FRA), Karoline Wickholm (FIN), Anna Kull (SUI), Pavla Krauspe (SVK), Anita Flamand (AUT), Elzbieta Dolinska (POL), Helma Schwarzmann (GER) and Sue Detol (USA) awarded a massive score of 9.119 there was an intake of breath from the crowd. Clearly no-one else could come close to that. Her combined total of 8.718 would definitely be a gold medal winning one. Italy’s Anna Cavallaro had been showing increasingly strong form all week, and with her lunger, Nelson Vidoni, and her horse Harley, she posted 8.697 to bring her overall total to 8.452 for the silver, performing a beautiful final freestyle to Andreas Bocelli’s Sogno (Dream). Switzerland’s Simone Jaiser, her horse Luk and lunger Rita Blieske were close behind in bronze position with a final tally of 8.433. “It’s been an incredible week” said Eccles who was also crowned world champion at the Alltech FEI World Equestrian Games™ in Kentucky, USA four years ago. “To come back here after the last WEG with the same team and horse is amazing, and to win another gold makes it even more special.” Her wonderful horse, WH Bentley who has now competed in four editions of the FEI World Equestrian Games™, was every inch the gentleman today as always. At 20 years of age he is only five years younger than his vaulting partner, and he stood quietly but proudly beside Eccles’ father and coach, John Eccles, as they all took their bow at the end of another extraordinary performance. “We came here with high hopes, but you have to do four good rounds to win a medal,” said John, “so we just took it one round at a time and I have been so proud of each performance and we have got the result we wanted. I am delighted with what we have achieved” he added. “Today we just wanted to show what we have been doing in training at home for the last few years and to put on a show – and we have had a great time doing it” said Joanne who is a dentist, and works four days a week in a practice near her home in Kinross, Scotland. “It’s only 20 minutes from work to home. We live on a farm and we have converted a shed into a training room and gym” said the athlete whose fitness plays a huge role in her success. It was a glorious day for France as Jacques Ferrari took Male Individual gold ahead of fellow-countryman Nicolas Andreani in silver medal spot. Germany’s Erik Oese was awarded a big mark of 8.835 for his brilliant performance today, but it wasn’t quite enough to squeeze ahead of Andreani so he had to settle for the bronze on a final score of 8.483 after a superb week. He was, however, only 0.015 off silver medal position and looks like a man with a big future. “I am absolutely delighted with my result, every medal is a medal,” Oese said. “This is my first WEG, and I found it harder than the two other championships I have attended but it has been fun” he added. Andreani’s now-famous Einstein-themed freestyle is always a big hit with the crowd, and today was no exception. However Ferrari’s programme had spectators riveted to their seats until the music stopped and they went wild with delight. “This is the crowning moment of a long process of many years, not just for myself but my family, friends and my team-mates, and the culmination of the development of a style I have tried to design” Ferrari said. It seems his future is unsure however. “This is a sign that I have reached the limit and the pinnacle of my career, so I don’t know what will follow” said the vaulter who has now holds both the individual European and world titles. Andreani insisted he was happy with runner-up spot and that he really didn’t expect it. “I feel a great sense of satisfaction with the silver medal, especially since the last two seasons have been difficult for me, so I am very happy” said the former world champion. Further down the line, another young man also drew a huge reaction from the enthusiastic crowd. With the support of the FEI Solidarity Programme, Lambert Leclezio from Mauritius made his championship debut this week and his exceptional talent was recognised by a sixth-place finish today. There was a unique and subtle level of sensitivity about the way this slim 17-year-old executed near-balletic movements together with his horse, Timothy van de Wilhelminaho, and lunger Roost Hanemaaijer-Slotte. Leclezio is a name we may well expect to hear a lot more of over the coming years. The noisy French supporters had plenty more to cheer about when the host nation also took the bronze in the Squad final in which Germany claimed the gold and Switzerland took silver. This was a thriller from start to finish, but Paulina Riedel, Mona Pavetic, Janika Derks, Milena Hieman, Julia Dammer and Johannes Kay, along with their lunger Jessica Schmitz and horse, Delia, were undisputed champions. Scoring a massive 9.058 tonight they completed on a final total of 8.724 when third-last to go. They followed a mesmerising performance from the French squad who received a standing ovation at the end of their programme. Their grey horse, Watriano R, was beautifully handled by lunger Fabrice Holzberger and their youngest squad member, Robin Krause, literally stole the limelight as he reached extraordinary heights during the pyramid movements. Anthony Presle, Nathalie Bitz, Dlement Taillez, Remy Hombecq and Christell Haennel worked brilliantly together to create a charming programme that earned bronze medal spot on a final total of 8.315. The Swiss team horse, Will be Good, was not in top form today but the all-girl side of Nadia and Martina Buttiker, Ramona Naf, Tajiana Prassl, Nathalie Bienz and Sally Stuckl stuck to their guns and it paid off with a score of 8.648 and a final total of 8.503 for silver. “It was difficult for our horse today, but we gave it our best” said Swiss lunger Monika Winkler Bischofber tonight. “We dreamed of gold, but congratulations to the German team!” she said. Asked if she thought it was unusual to have an all-female squad and if they might like to introduce some men into their selection, Winkler Bishofber replied with a laugh “a Vaulting team has no need for men! Our horse is smaller than the French team’s horse by at least 10 centimetres, so we need to be much lighter”. German lunger, Jessica Schmitz, talked about her squad’s journey to gold. “We started the season at Doha in Qatar and it is the first season for this horse. We have two new teams members so it has been quite difficult for us to put it all together but, right now, we are at our highest level. We have been working for more than a year on this freestyle and we have done a lot of extra training” she explained. Like so many of the other vaulters from many nations, Schmitz said that the Zenith Arena has been an amazing venue all week. “I think we must thank the organisers here in Caen for providing us with such a great venue and for providing such a great event” she said. German squad member, Paula Riedl, concluded “we have had a great time here in Caen. It was very important for us to have a good show here but the gold medal is just a bonus. Our success has been working together as a team”. Squad Final: GOLD – Female Individual Final: GOLD – Joanne Eccles GBR 8.718; SILVER – Anna Cavallaro ITA 8.452; BRONZE – Simone Jaiser SUI 8.433. Male Individual Final: GOLD – Jacques Ferrari FRA 8.629; SILVER – Nicolas Andreani FRA 8.498; BRONZE – Erik Oese GER 8.483. Pas de Deux Final: GOLD – Jasmin Lindner/Lukas Wacha AUT 9.059; SILVER – Pia Engelberty/Torben Jacobs GER 8.605; BRONZE – Joanne Eccles/Hannah Eccles GBR 8.575.